The AD9833 is a DDS function generator programmable by a SPI interface. The version I bought , pictured below, includes a MCP41010 8-bit digital potentiometer and an opamp to boost and control the amplitude of the output. The attached Basic program shows how to control both the potentiometer and function generator to create Sine, Triangle, and Square waves of varying amplitude and frequency. It would be easy to combine this code with the GUI from this post to make a complete application. 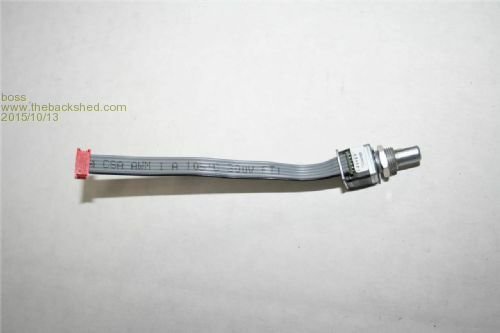 another choice is to use an optical encoder. I found this one (Grayhill with push button) on ebay for ~$10 new. I ordered one of the AD9833 modules above sometime ago and started to write a GUI for it. I was removing the header pins to put it into a case when I made it not work by breaking some tracks. So I ordered another one and then also managed to repair the first one. So I updated the GUI to make a dual channel signal generator. The code for an MM2 with a 320*240 screen is below. It uses all Peter's code, gets a few ideas from Parking Assist and Boat computer, and I used FontTweak to make the graphic fonts. Thanks,Peter,Geoff and Jim. I terminate the signal output in a 50ohm resistor as its supposed to be 50ohm output impedance. The software works without any hardware attached so it can be run to get a feel for the interface with just the MM2. garbage is always somewhat remaining. It was after the purchase that I found it used 8038 with microprocessor. little steps left in the signal that annoy me. digital scopes are a very good example of a really useful tool for certain tasks, masquerading as a very different tool that is emulated poorly. over the years i've used several different DSOs (including $50,000 agilent models), and been highly disappointed with their inability to work like an analog scope. but this is the nature of the beast - DSOs are not a real-time display device, they are a high-speed data acquisition system who's output is best viewed after the event. an analog scope, on the other hand, does not acquire data, but merely displays an event as it happens, with the successful displaying being largely dependant upon the event being repetitive. there are many tasks that a DSO performs admirably, tasks that an analog scope could not handle. similarly, there are tasks that an analog scope can do most successfully, but at which a DSO struggles or fails completely. a modern 4-channel DSO with deep memory is magic for digital work, but no replacement for a relatively inexpensive (older) analog scope when you're doing RF work. much the same holds for digital synthesised signal generators. What the world needs is an analog flat panel display ! This will work with the other modules described here with a few small modifications to the code. If anyone want my circuit diagram, please ask. I used a PEC16-42 24-detent incremental encode available from Element14 for a couple of dollars. These things are cheaper than pots, and can then be re-used by the software. Also much better when you want to save favourite values. 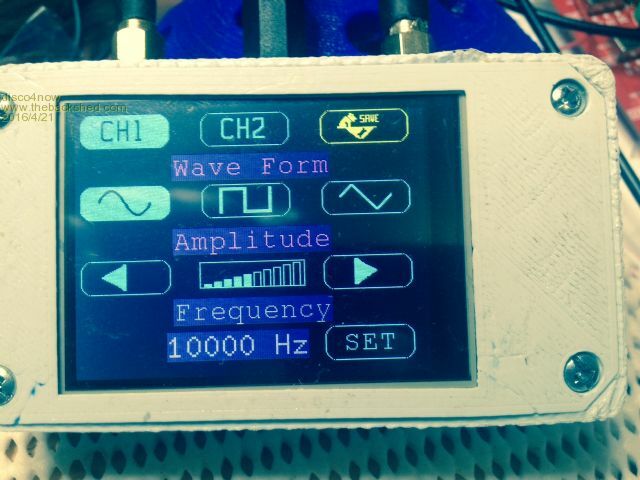 In terms of the DDS, the output is VERY clean, one of the best sine wave sources I have ever used. The XR2206s are awful and a really designed for RC setup rather than microcontrollers, and while a good Wein bridge is very clean, they can be very contankerous. Nice project indeed. Could you release schematics? Sorry about the hand drawn design. It doesn't have a huge output swing (600mV p-p), but it does drive 50ohms. I would add a gain stage if I was better at RF. I built this on prototyping board and it works very well. I'd be inclined to use the fully implemented board if buying from fresh. The code could be easily modified to suit. You could probably get away with a single 5V supply, although I haven't tested the LTC1010 with it. If you want to use the sweep, think about adding a couple of lines of code to output a pulse at the start of the sweep to trigger the DSO. The code implements a basic windowing API. I know the mm plus has this already, but there is no space left on the mm2, so I don't think it will be added. This allows you do create dialogs by defining the controls and providing a command code. This does all the drawing and touch detection, so you just need to add case statement entries for your event handler. I had a go at using gradients for buttons - the code is in my bas file. They look really good, and change the appearance to look professional, but are a bit slow to draw so they need to be implemented in C.
Thank you very much. I'd like to have constant signal level in frequency range from 1000 Hz-12.5 Mhz, but no fully success yet. The signal generator is built on SnadPic (MM+ 100 pin) board so I have plenty of pins left for additional functionality . I tried to use some ultra-fast operational amplifiers, but nothing works fine. I'm surprised you are omit LP filter on DDS output. Did you check the output signal with oscilloscope? May be the LT buffer chip will work for me as well.